Gareth wanted to help a lot with the puzzle this year. I tried to involve him a little, but to be honest, I was usually glad when he lost interest in helping and went back to playing Dirt 2. He did put a few pieces in though, even correctly placing a piece of the sky before we'd started working on that section at all and without any help from me. I keep thinking we'll have to be sure to get some puzzles of his own out for him next year, but I have a feeling he'll still prefer to help with the big one rather than do his own. Next year's will probably be much more difficult, so we might have to start a bit earlier if we hope to finish before we all have to go back to school/work. Hey! We did the same puzzle over Christmas! It is a fun puzzle! 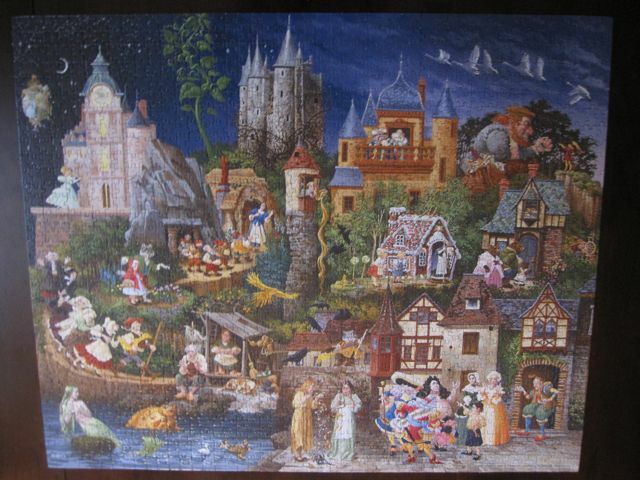 WHAT A GORGEOUS PUZZLE!! That looks like a really fun one. I hate ones with all sky. UGH.